You have to hand it to actor Danny Trejo as he just never seems to slow down these days. The former character actor turned leading man turned restauranteur is not so quietly taking over the L.A. landscape with his Trejo’s Tacos, Trejo’s Coffee & Donuts, and Trejo’s Cantina. That’s what the gregarious actor told me earlier this year about his light speed ascension in the L.A. food scene. 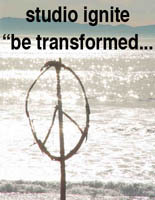 “I’m 73 and every day I wake up and something more exciting is happening,” Trejo reflected. A senior with a menacing face and a smile that beams total sweetheart, Trejo’s latest ventures showcase the other side of Danny Trejo—Mr. Nice Guy. There are currently three Trejo’s Cantinas (Hollywood, Pasadena and Woodland Hills). These are bigger productions than the more casual Trejo’s Tacos (with locations on La Brea Avenue and USC Village), and they have full bars, which is just plain better. In fact, the Trejo’s Cantina at Warner Center in the Valley features all of Trejo’s concepts– Donuts, Tacos, Cantina, along with indoor and outdoor dining. While I had mixed feelings about Trejo’s Tacos as far as bang for your buck, Trejo’s Cantina really seems to put it all together. There are more menu options, the pricing seems better, and, oh yeah, there’s a full bar. During our recent visit for dinner, we started with “cocteles” with the O.G. (classic margarita) and Paloma (blanco tequila, fresh lime, simple syrup, grapefruit). Believe me, this is a great way to start. 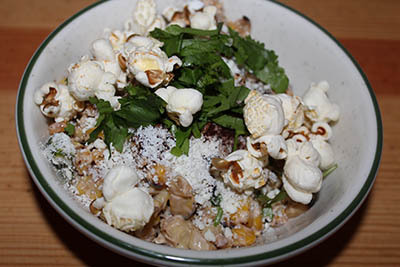 And speaking of starting, start your meal with the fantastically flavorful Brussels Sprouts with red chimichurri, agave, and toasted walnuts, along with the Street Corn with charred corn off the cob, chipotle, and popcorn. 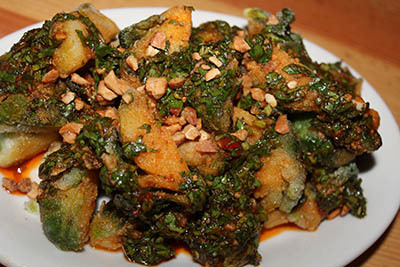 These are winning dishes, especially the outrageously delicious sprouts. While the menu is varied, let’s not pussyfoot around—make sure if you come hungry to get the Surf ‘N’ Turf Burrito with shrimp, steak, potatoes, bean dip, slaw, pico, and cheese, served wet along with a side salad. Even if you don’t come hungry, take what you don’t finish home with you and enjoy it all over again later. This one is a definite crowd-pleaser. This is as hearty as a burrito gets without being food challenge oversized. 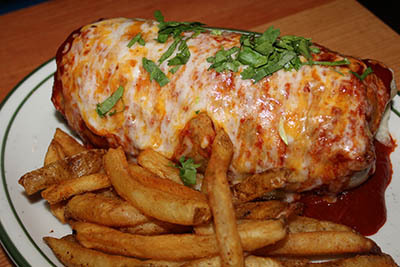 Believe me, there’s a lot of taste packed into this beast of a burrito. Another solid option, albeit more diet-friendly, is the Chicken Fajitas with onions, peppers, fixings and flour tortillas. There are also shrimp fajitas as well, but the chicken was recommended by the chef and they were a spot-on selection. If you find you want more cocktails, The Cartel with cucumber vodka, fresh watermelon juice, triple sec, and fresh lime, along with Danny’s Spiked Lemonade (bourbon, lemon and honey) are easy going and refreshing options. I thought I would have liked El Diablo with mezcal, fresh lime, agave, Campari and serrano more than I did as I’m a big fan of mezcal and Campari. And if you’re a fan of liquid dessert like I am, the Horchata Fuerte with dark rum, horchata, and a cinnamon-sugar rim is a good finisher. Unless you’re really feeling the Churros served with strawberry and chocolate dipping sauces for actual dessert. 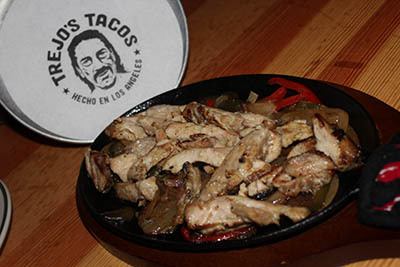 But let’s not forget about the tacos at Trejo’s, it is after all his namesake dish. And at Trejo’s Cantina, just like at Trejo’s Tacos, there are plenty of tacos to choose from. The list includes Carnitas; Steak Asada; Blackened Salmon; Brisket; Spicy Shrimp; Grilled Chicken; Baja Fish; Young Jackfruit; Cauliflower; and Mexi-Falafel. I found all the vegan options (Young Jackfruit; Cauliflower; and Mexi-Falafel) to be solid. 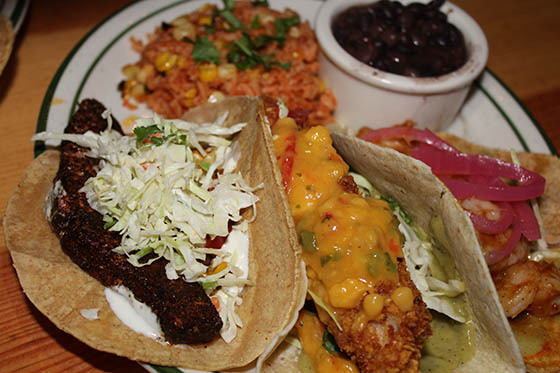 And of course, you can’t go wrong with carnitas, carne asada, spicy shrimp or fish taco. Mix and match to your heart’s desire and enjoy. Sober now for nearly 50 years, Trejo, refuses to buy into the notion and trappings of Hollywood and stardom, staying humble and grounded is how he survives. While success couldn’t happen to a nicer guy, succeeding with all his ventures is also a nod to Danny Trejo's mother, which just makes this an even sweeter story. 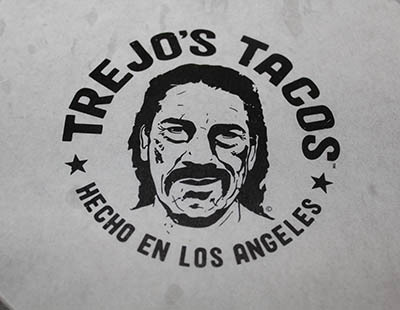 Danny Trejo’s ever-expanding ventures includes Trejo’s Tacos on La Brea Avenue and USC Village; Trejo’s Coffee & Donuts in Hollywood on Highland Avenue; and Trejo’s Cantina in Hollywood, Pasadena and Woodland Hills.